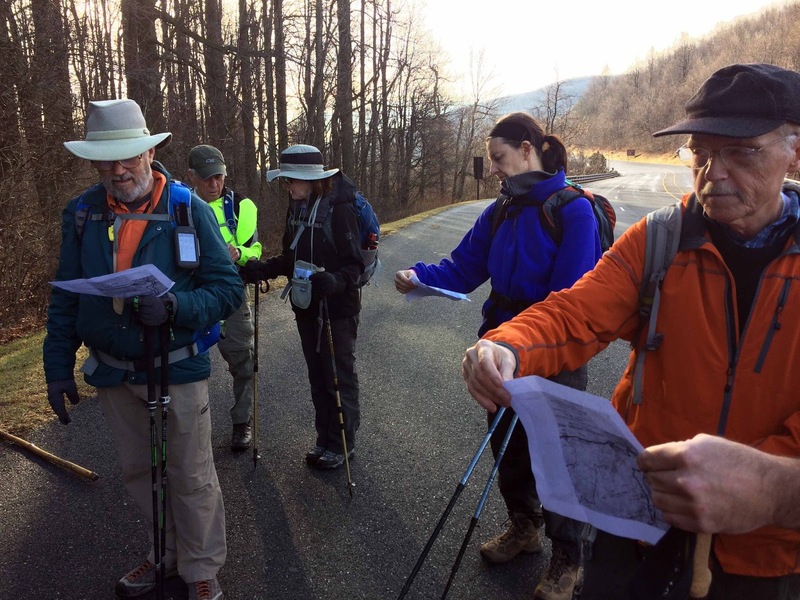 Fifteen hikers braved the cold and the wind, hiking the Appalachian Trail south from Jarman Gap to Beagle Gap starting from a different approach. 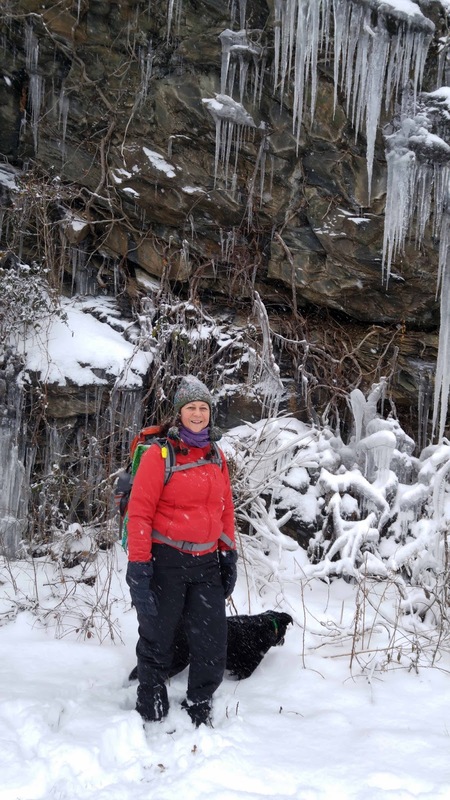 Hiker leader, Marit Anderson, and assistant, Mark Perschel met the others at Brownsville Elementary at 9 am and car pooled up Jarman's Gap Road through Crozet. 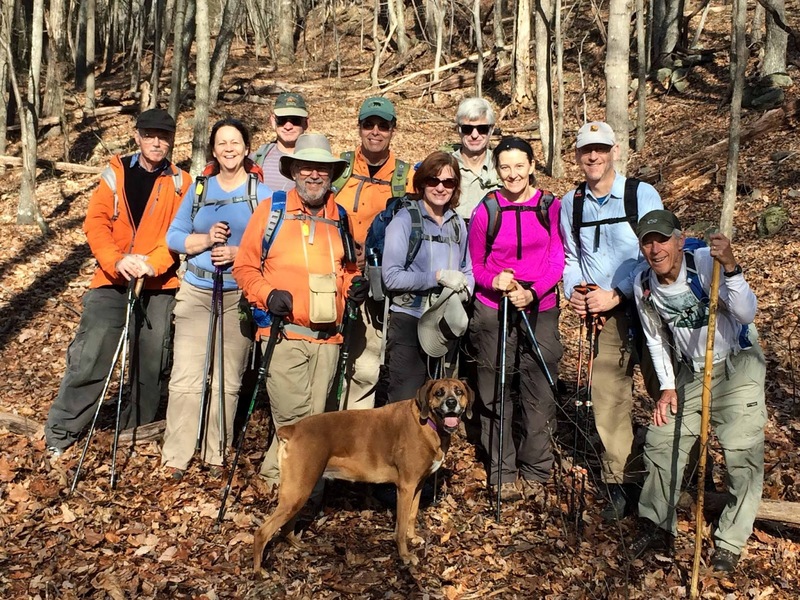 The hikers included Dan Ralston & Jeanne Densmore, David Crowe, CJ Woodburn, Tony Alimenti, Susan Quinn, Jeanne Siler, John Shannon, Nancy Handly, Susanna Williams, Marie Moss, Iva Gillet, Dave Borszich, Ginny Barber, Steve Thompson, and John Brandt. Taking the 2.2 mile dirt road straight up along Lickinghole Creek and parking at the top we proceeded a quarter of a mile down to the intersection of the AT. The group went south 1.5 miles on the AT and then took the side trail to Calf Mountain Shelter to enjoy a snack of chocolate chip cookies, water, and hot drinks in the wind break of the structure. 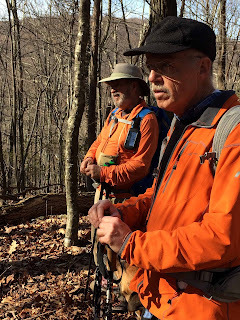 After our break we retraced our steps back to the AT and continued along Calf Mountain to Little Calf Mountain. 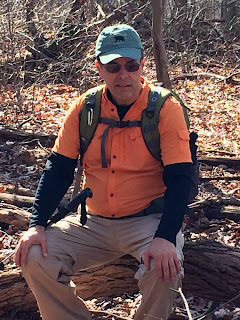 The view was clear and beautiful at the top but we continued to Beagle Gap and partway up the hill, deciding to stop there for lunch instead of continuing to the Bear Den Mountain tower complex. 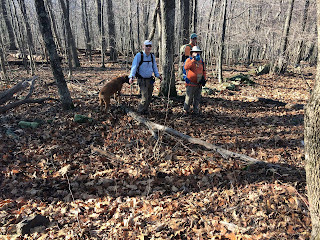 Chilly temperatures made our meal short and we returned back on the AT, but taking a detour down a fire road near the end of our route to see the possible PATC cabin and land acquisition site, which is currently being reviewed. When we arrived back to our cars after the 7.5 mile hike with 1,284 ascent we were happy to regroup. 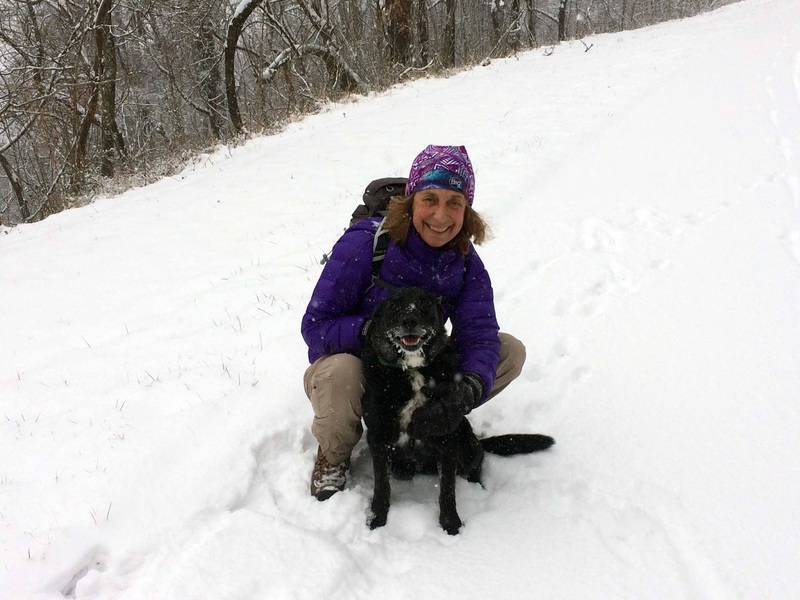 Marit and Mark invited all of the participants to stop by their house in Crozet for adult refreshments, hot drinks, snacks, and a warm home, and many did so after retrieving their cars. Thanks everyone for sharing the day! A foggy and gloomy Saturday in Charlottesville had no effect on higher elevations in the Blue Ridge, where it was sunny and bright. Eleven “Adventure Hikers” attended a warm January 21st hike, including Taylor Putney, Gabriel Garretson, Michael Seth, Henry Reeves, John Shannon, Marion Styles, Marie Moss, John Brandt, Iva Gillet and Remy the Incredible Hiking Dog, Bill Holman, and hike leader Jeff Monroe with Gracie the Ultimate Hiking Dog. 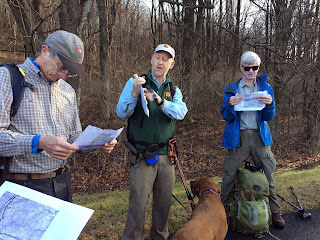 This was an Adventure Hike because, using a 1934 Topo Map and a 1941 PATC Trail Map, the group went off trail onto the remains of an old road starting near where the A.T. meets the Saddleback Mountain Trail. 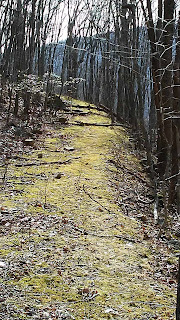 The roadbed was hard to follow at first, but later became very obvious. 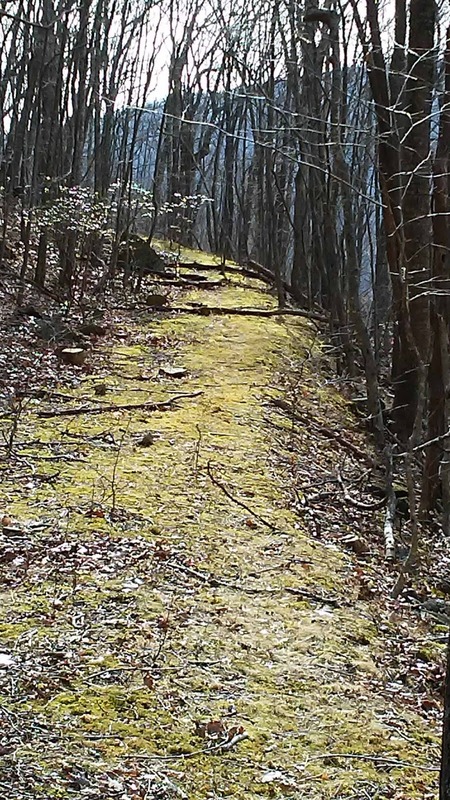 The group followed this old roadbed to the old Spottswood Trail - the original route to the Shenandoah Valley, built in the 1800's and superseded in 1930 by the present alignment of the road, now better known as U.S. 33. 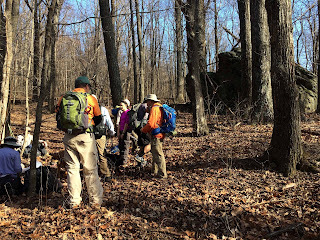 Despite disappearing from trail maps over 75 years ago, the old Spottswood Trail was in beautiful shape, and the group spent the day looking for evidence of old houses and the old Big Bend School along their route. Gabriel was the big winner, finding several old metal washbasins near the apparent location of the former school. 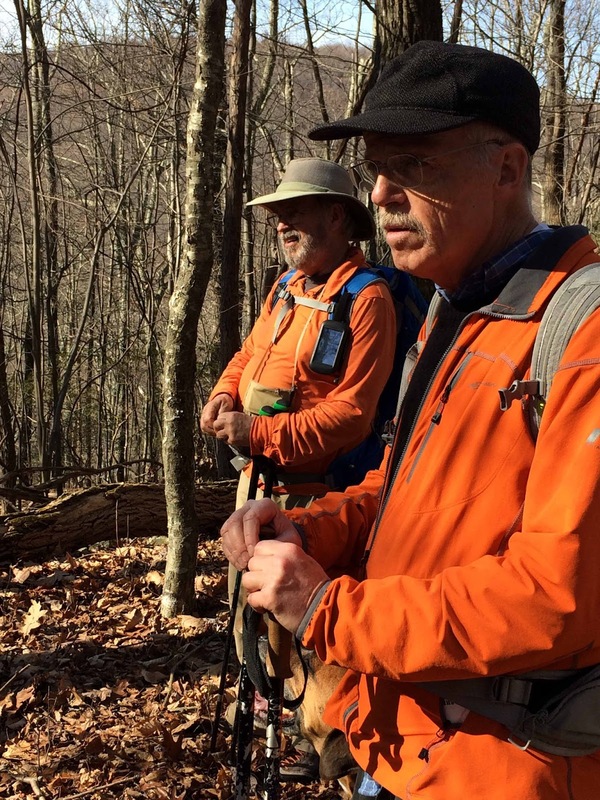 Michael Seth, who has hiked all trails in Shenandoah National Park, said it was great to explore new parts of the Park only a half hour drive from his home! Everyone enjoyed the exploration into the Park's past. 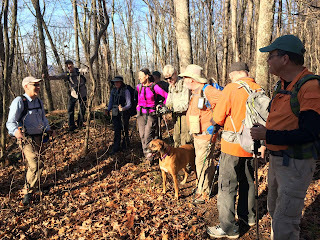 Our scheduled hike on Chimney Hollow Trail was changed to a hike down the snowy Blue Ridge Parkway heading south from Rockfish Gap. Barbara Martin and Iva Gillet with her wonderful doggy Remy braved the cold and were rewarded with sightings of cross country skiers and icicles. 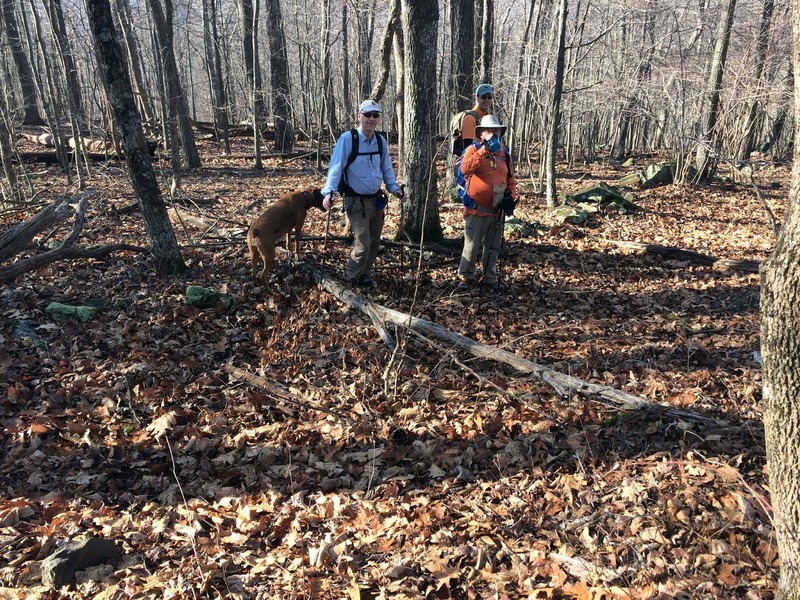 The last day of 2016 was enjoyed by thirteen hikers at Ragged Mountain Natural Area with Marit Anderson leading, and Mark Perschel assisting as sweep, on a seven mile trek using the Main Loop Trail and trails across the dam towards the new floating bridge. Views of the water most of the way and 805 ft of ascent made for some good physical exercise to bring in the new year with festivities later in the night. The group included newcomers, Abhishek Shelar and Linda Staiger, as well as Marley McGrath, Pete & Bev Fink, Marian Styles, John Shannon, Nancy Handly, Jeanne Siler, Susan Quinn, and Dennis Templeton. 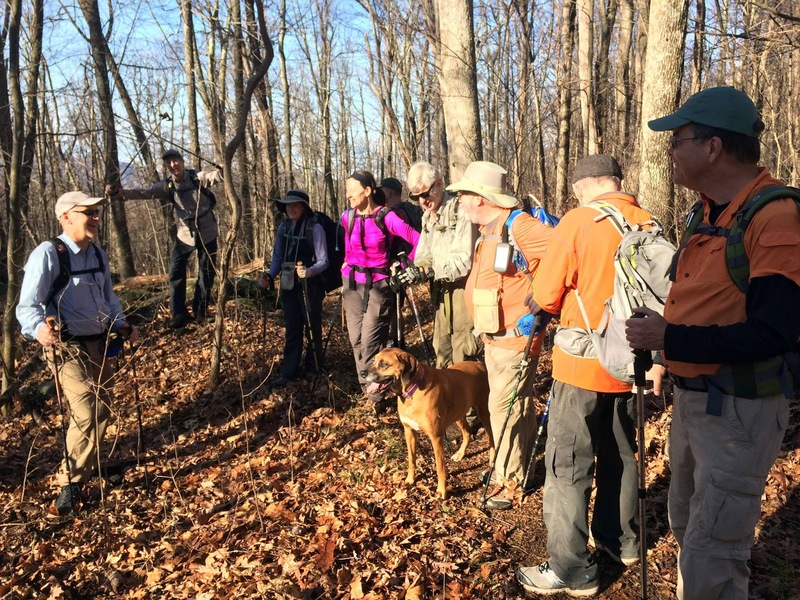 The Ragged Mountain Natural Area is a 980 acre preserve surrounding the Ragged Mountain Reservoir and is managed by the City of Charlottesville Parks and Recreation Department. The new Ragged Mountain Dam was completed in 2014. It has been a water source for Charlottesville and the university since the 1800's. 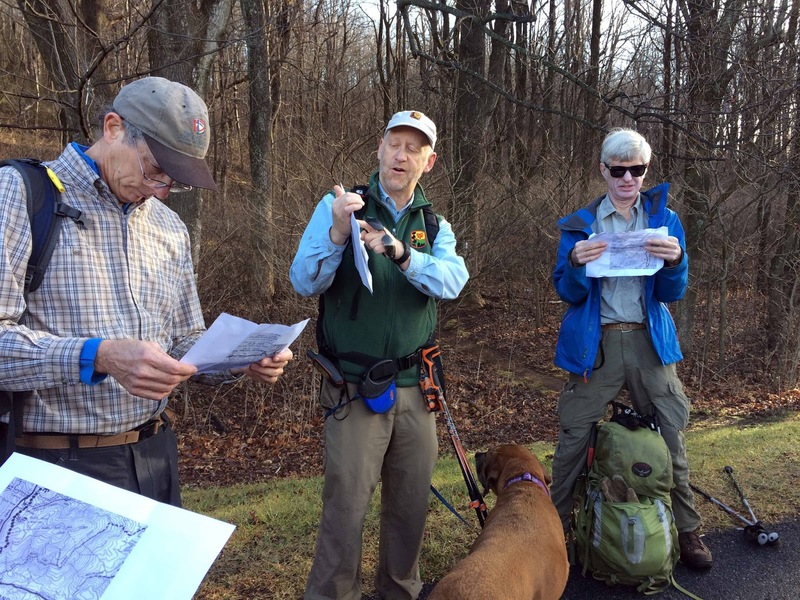 We are thankful to the Ivy Creek Foundation and volunteer trail builders that have created many of the new trails. We look forward to returning when the entire 7.3 mile loop will be completed around the lake. PATC members love Mr. Bear! 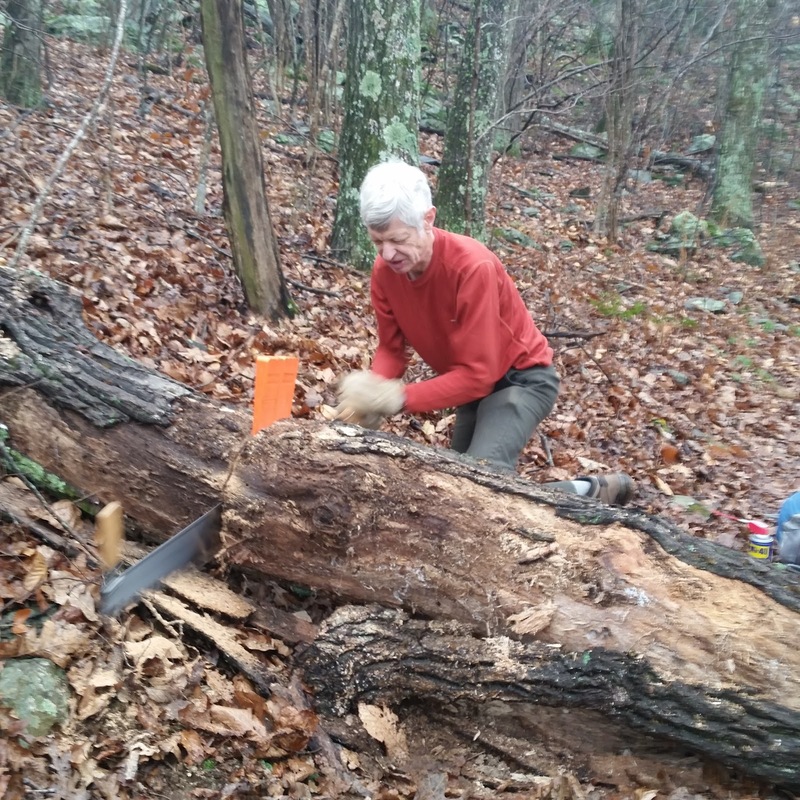 On Christmas Eve, Marian Styles and I gave to the AT and its users by cutting some logs on the Chapter’s AT section. Since it was not only Christmas Eve but raining in the morning, no one appeared at Albermarle High to join us. 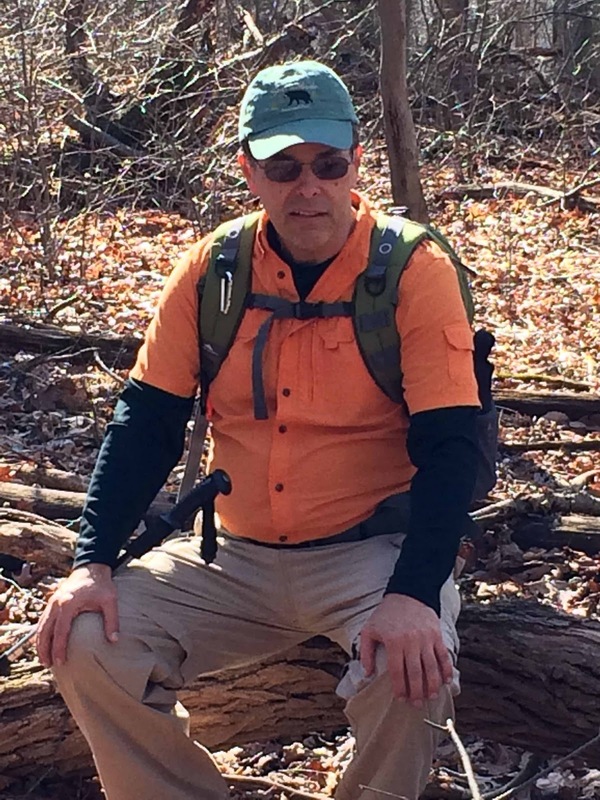 By the time we reached Rockfish Gap, a wave of my arm cleared away the rain, ushering in fine trail-clearing weather. Soon after starting, we saw the first blowdown reported by David Crowe, but we left it because we knew of bigger logs ahead. The first was a 10-inch log. Moving it off the trail without destroying a small tree took almost as much effort as cutting it. 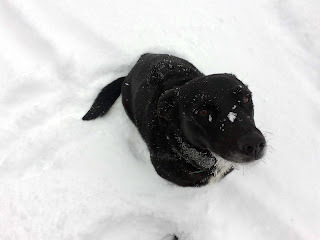 A bit further along, we found the big one. I had seen it on a previous trip, but the saws we had that day would do little more than scratch it. Today we had the Chapter’s new cross-cut saw, ready for its first real test. 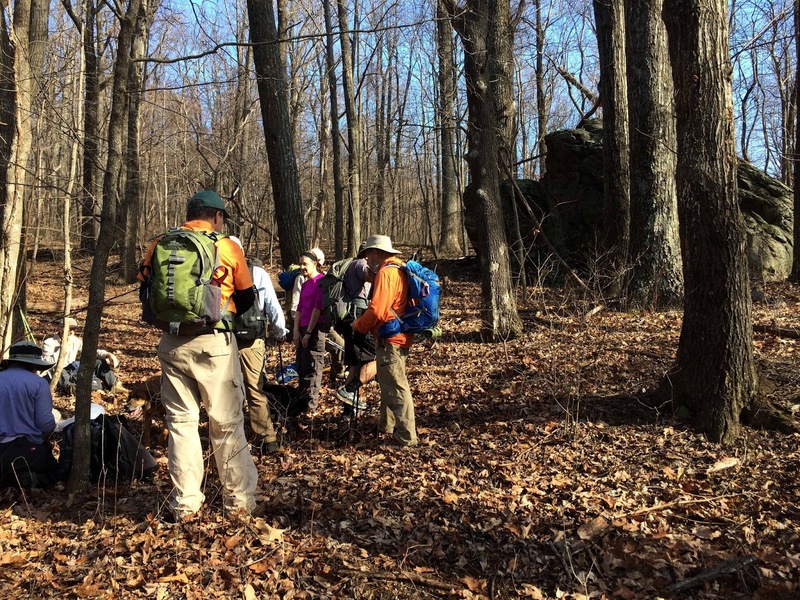 Some long wedges proved useful in opening the 15-inch cut on the uphill side of the trail. Marian made the final cut, which left the job of retrieving the saw and a wedge, which had gotten trapped. A trusty Corona saw moved enough wood to free the items. 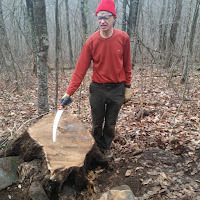 As expected, the downhill section of the tree was too large to move, or even wiggle, requiring a second cut. 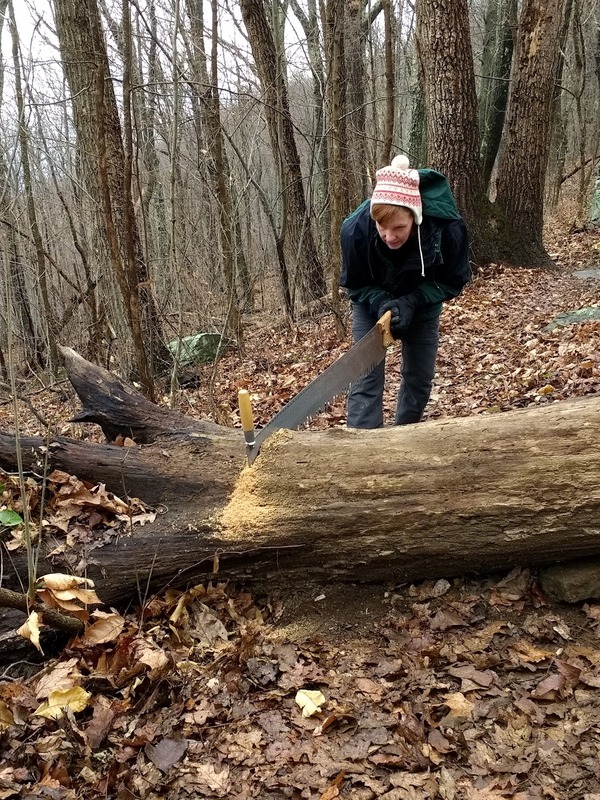 The log was resting on rocks at the optimal place to make the second cut, but we wanted to avoid hitting rocks with the new saw. 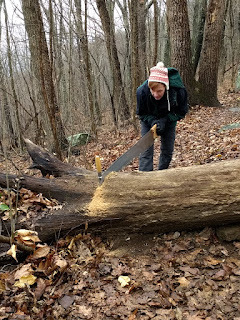 So we could either cut through a narrower point on the log, which would leave some of it still in the trail, or we could cut further down where the log was considerably wider, which would free all of the log on the trail. We chose the latter. While I slowly cut, Marian went a little further up the trail to clear a couple of branches encroaching on the trail from a tree that had fallen beside the trail. Lunch offered a break from the tedium of cutting. Marian removed some more wood in the gap from the first cut so that there was room for the center section to move into as the second cut widened. 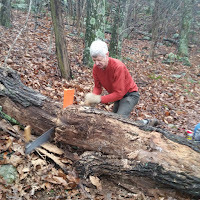 While we were cutting our way down to ground level, the log seemed to drop down further, so I had to create trenches for the saw. The good news was that the saw did not bind, and the wedges again widened the cut. Finally, after about 2 hours of sawing on this tree, the wood broke. 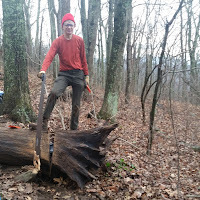 Marian took pictures of me standing triumphantly on the cut log, estimated 24 inches across. 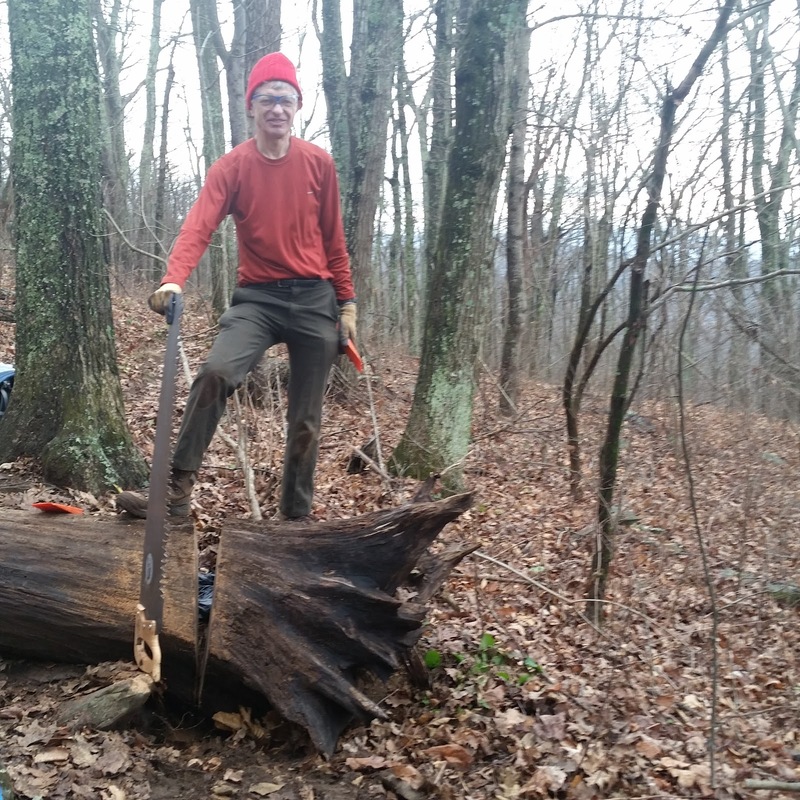 Removing the weighty log from the trail was the next problem. We rolled it a short distance to make a walkable gap between two sections and declared victory: we were a cutting crew, not a moving crew. We put the new Dan Dueweke-style saw guard back on the saw. 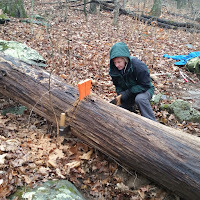 Three items—the cross-cut saw; new, longer wedges; and saw guard—all worked as hoped on their first major trip. Fatigue, cold, and evening plans said it was time to head home.